November 8, 2017 By Liz 15 Comments Note: This post may contain affiliate links. This post is sponsored by BabbleBoxx.com on behalf of Alexia. Thank you for supporting the brands I know and love! As always, all opinions are my own. I’m so excited about this salad recipe. I know I’m kind of a weirdo because I get so excited about salads but this one is so good. 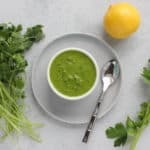 It’s crunchy and tangy and sweet and tart and I hope you love it as much as I do! (Wo)man cannot live on salad alone. Am I right? Served next to this lovely salad are two new complete side dish options, coming straight to you from the frozen food aisle. Alexia, the company that makes my most favorite sweet potato fries, just came out with a new line of premium side dishes and they’re going to knock your socks off. Not only are they gluten-free and non-GMO project verified (woohoo!) but the ingredients they use are the cream of the crop. 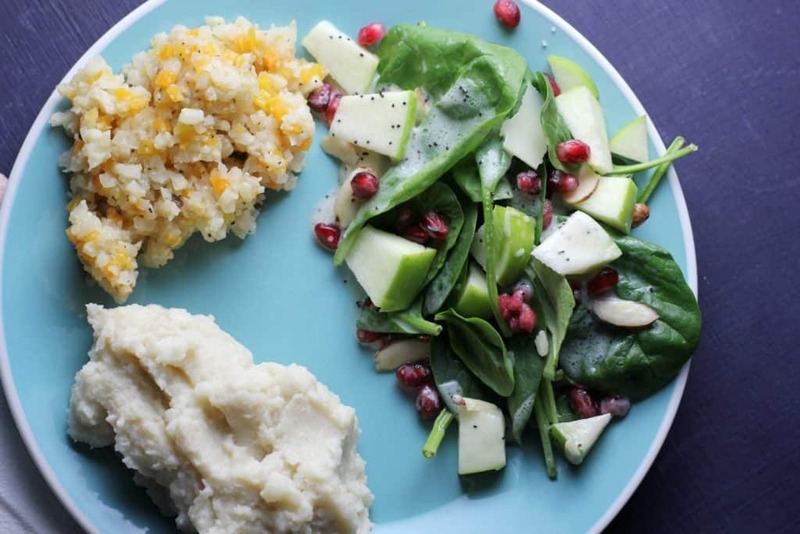 Think of these dishes as… starch alternatives. Basically, you get your carb fix in a lower carb kind of way. I know, it’s magic. 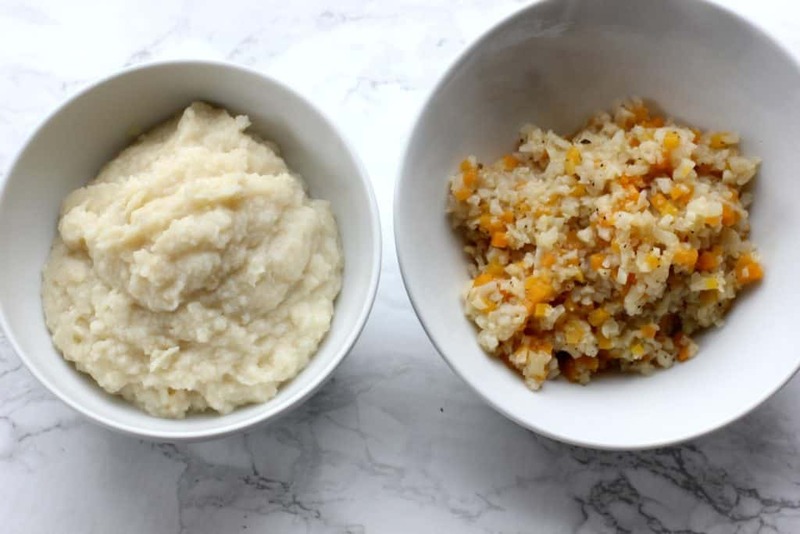 I tried the mashed cauliflower which was nearly a dead ringer for mashed potatoes. Like, no joke. I actually checked the box to see if it was a blend of cauliflower and potatoes because it was so creamy! I also tried the riced vegetable pilaf, which is a blend of cauliflower and butternut squash… and it did not disappoint. I actually couldn’t believe something so delicious could come ready to cook out of the bag, in less than 10 minutes. Ya feel me? Mmk. So let’s get back to that salad recipe. In a blender or food processor, combine the yogurt, apple cider vinegar, honey, dijon mustard, avocado oil and salt. Transfer to a small jar and stir in poppy seeds. Slice the granny smith apple into 1 inch pieces. 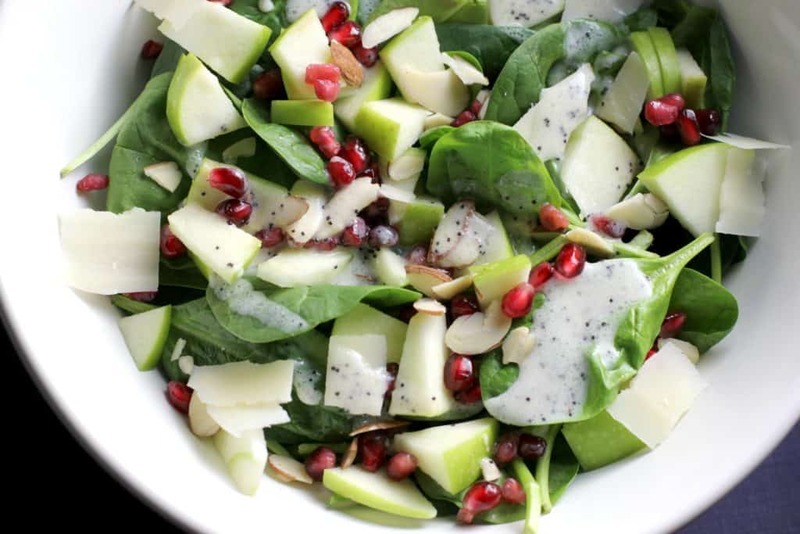 Toss the spinach with the apple, pomegranate seeds, almond slices, and cheese, if using. The cheese is totally optional. If you leave it off, you may want to add a tiny pinch of sea salt to your salad at the end. Also, you might not need all the dressing but you can store the leftovers in the fridge! Don’t mind me. I’ll just be over here eating this delicious plate of awesomeness. What are your favorite side dishes to serve with a delicious salad? 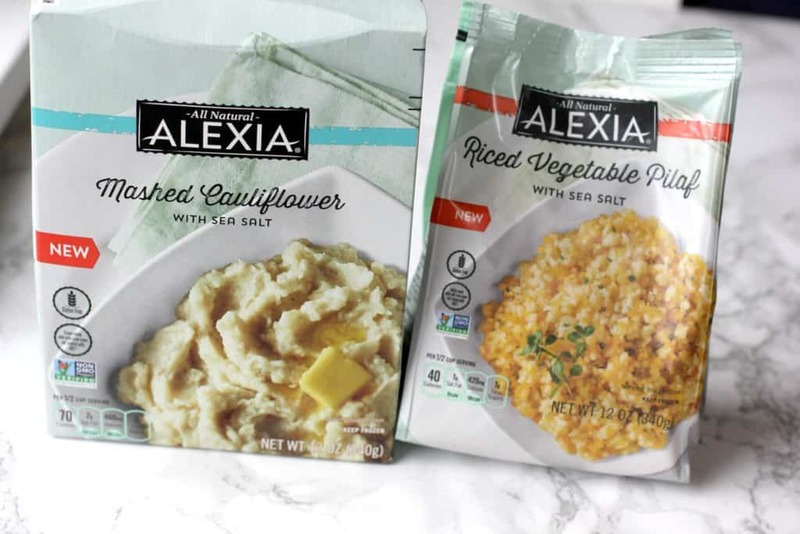 Alexia is an excellent brand and I can’t wait to taste their mashed cauliflower and vegetable pilaf. 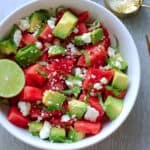 Thank you for sharing your fabulous salad recipe! 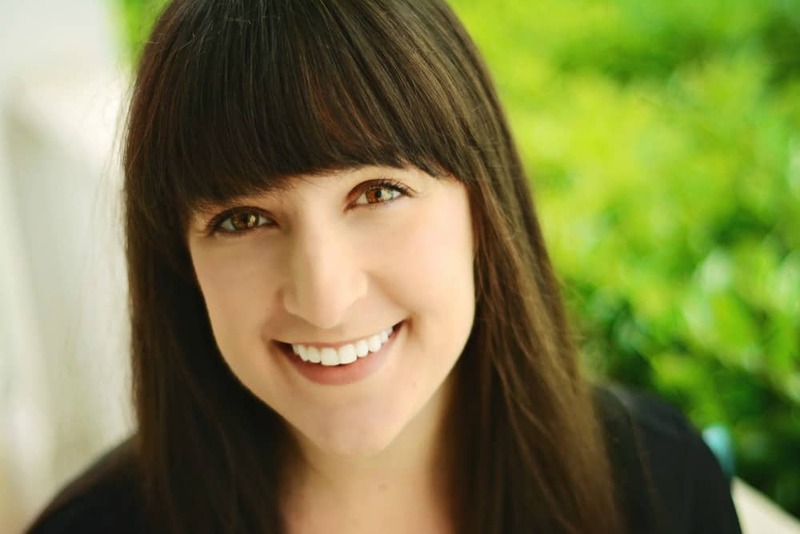 I’ve heard so many good rave reviews on Alexia products! I think it’s so cool how they snuck cauliflower into it. I LOVE a good salad with toppings and yummy dressings; I understand your enthusiasm. 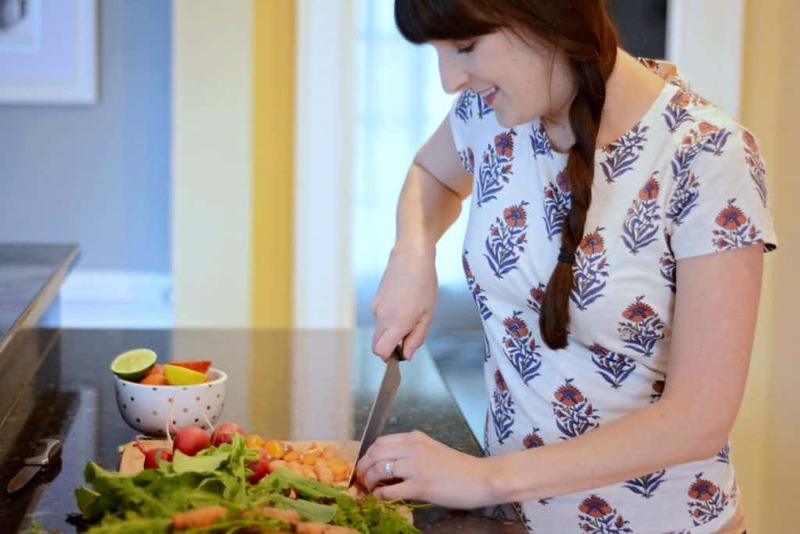 🙂 God made so many wondrous veggies and fruits, and there are so many different kinds of combinations you can do. 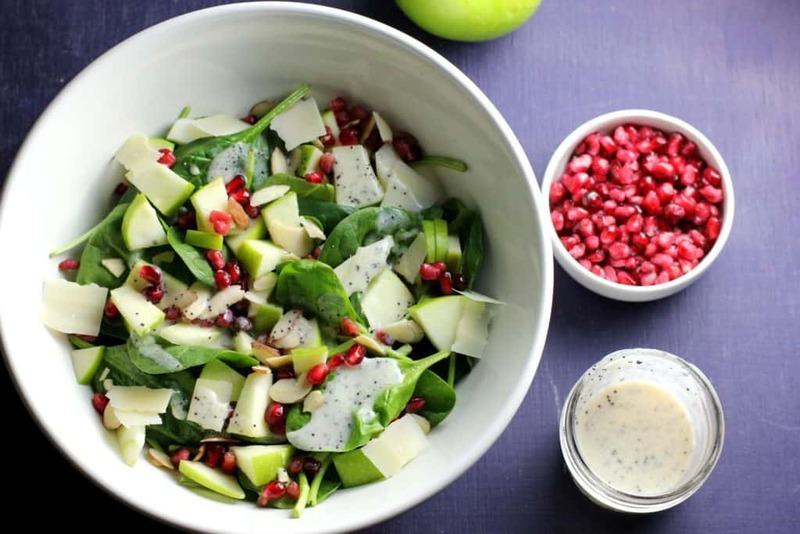 Love the colors in your salad — I happen to have pomegranate in the fridge, too — definitely going to give this a try! Didn’t know about those Alexia sides, they sound healthy and convenient. Looks delicious! I’ve wondered how to make poppy seed dressing too. Thanks for the recipe! Looks great! The salad is so colorful and the sides look amazing too. 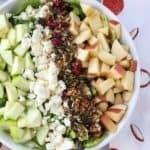 I’m saving your dressing recipe for other salads, too! I love poppy seed dressing. Your salad looks delicious! And, I’ll have to look for the Alexia products. I love everything about this salad!! Thank you for bringing it into my life! Lovely salad, crunchy and sweet. Great gluten free options those Alexia mash. That dressing looks so delicious, what a lovely salad! Now this looks and sounds like my kind of salad, the dressing sounds especially delicious! Yum!! So fall-ish! 🙂 I love poppyseed dressing! 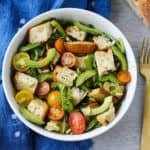 This salad sounds amazing! 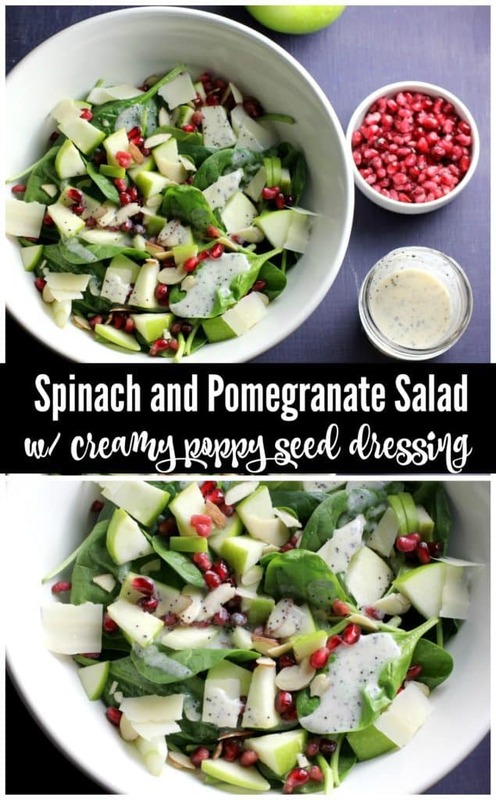 I LOVE adding pomegranate to salads!